MUST. GET. SQUIRREL. (don’t know why, but) MUST. GET. SQUIRREL. Hm. This smells interesting. I must lift my leg. Hey, ducks! Must get ducks. Drop the leash. Drop the leash. Drop the leash. Drop the leash. Drop the leash. It was a beautiful day in the park today. 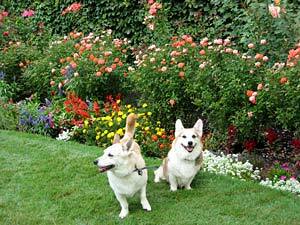 We like the flowers. But the roses bite back. We went to the pet supply store so Daisy could pick out her gifts. She got a bunch of fancy dog cookies and big bones. Thankfully, she chose well, because my folks got the same thing for me. 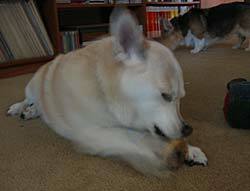 Here is a picture of Daisy gnawing on her bone and me looking for crumbs. This is a truly awful picture, but we are too enamored of our snacks to pose. My folks have begged me not to reveal this deep dark secret about them, but I pretended not to listen (I’ve been practicing that for years). My folks have a can of whipped cream in the fridge. They squirt dollops of it onto the kitchen floor for me and Daisy to lick up. It’s a dessert topping and a floor wax!